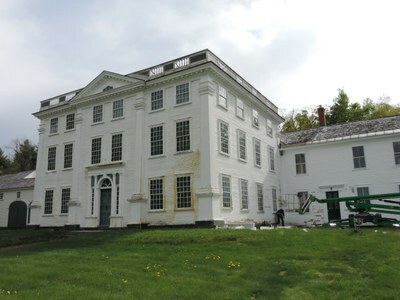 An exterior preservation project at Barrett House in New Ipswich, New Hampshire, recently began with the removal and assessment of more than 150 wood shutters adorning the c. 1800 mansion. A painting crew is on site and has started prepping the siding and trim to receive a fresh coat of paint. This project also includes the repair and painting of the property’s front iron fence and gates, a new roof on two sections including the main museum, minor masonry repairs, and window conservation. Good maintenance is good preservation. Please considering supporting this important project with a donation to the Preservation Maintenance Fund. Many thanks to California Paints for donating all of the paint being used in this project. Barrett House is open for tours on the second and fourth Saturdays of the month through October 15. Learn more about our approach to painting, roofing, and other preservation topics by visiting our white paper library.